In the early morning fog, two cows were struck and had to be put down, but the two drivers were not injured. AUBURN — You know what’s stranger than a guy crashing into a Black Angus cow on Pownal Road at 4 in the morning? Two guys crashing into two Black Angus cows on Pownal Road at 4 in the morning. It happened early Wednesday. Two drivers, two cows, two separate collisions. John Barbioni of Lewiston was the first to crash. 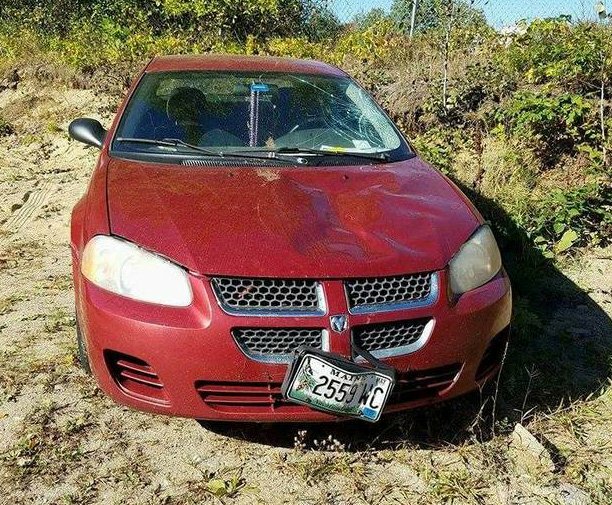 He was driving his Dodge Stratus north on Pownal Road on his way to work about 4:15 a.m. when a cow appeared in front of him. Barbioni, 58, was not seriously hurt. He was just beginning to adjust to the strangeness of the crash when things got stranger still. Yes, that actually happened. Seconds after Barbioni slammed into roughly two tons of beef, another driver did the very same thing 200 yards away. The second driver was Erik F. Stone, 35, of Durham. According to a police report, Stone was headed north when his GMC pickup truck plowed into a Black Angus cow. The police report notes that it was foggy at the time. Stone was not hurt, but his truck – not to mention the cow – did not fare so well. Both vehicles were towed from the scene. Both cows had to be put down and, no, neither man got to keep the animals for their meat. “I could have filled my freezer for the winter,” Barbioni said. According to police reports, the cows are owned by Aaron Thompson of Portland. The cows had apparently wandered away from a farm at 990 Pownal Road.